Maybe now you’re thinking a review about dove deo’s? Meh no that isn’t that special… But it is special because dove changed there formula. And did it become better or are these ‘new’ dove deo’s not worth it? At the dove event a while ago I received four deo’s with the new formula in the goodiebag. I was so excited to try these out because I was so curious to test the new formula! Is it worth it? So what did dove changed? Because we irritate our armpits with shaving, waxing,… With this you also remove the protective skin. So our armpits need more and better attention. 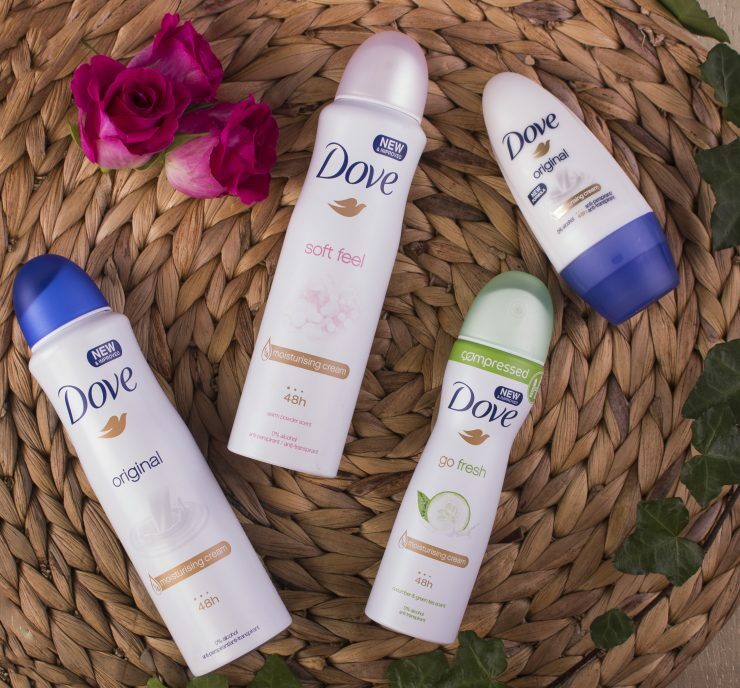 So dove introduced with these new deo’s to not only anti-perspiration but also protected and take care of your armpit. These deo’s exist for 25% out off moisturizer. So the new formula promise to protect your armpit for 48h and moisturize it! The smell from this deo is for sure one of my favorites ever! It smells so fresh and good! It’s the cucumber & green tea scent. And this one feels so refreshing! This is my must deo for in the summer! The small format is also perfect to take with you! A roll deo is also extremely handy to take with you. The original is more a milk and classic dove scents. To be honest I’m more fan from the go fresh scent but the soft feel one is all with all also good. This is more a powder scent with a warm musk and flowery smell. We already had the original in roll form but I also got it in spray form. Sometimes I’m more fan from the spray deo’s and the other time more from the roll deo’s. But both version scent and work the same. So how is the new formula? First of all the deo’s are for sure good and anti-perspiration for almost whole day. It depends from you activities! After a good sport session you need to refresh. But with normal days does this deo for sure his work! But the best part is they indeed take care of my armpits! My armpits are much soft and less irritated! So yes the ‘new’ dove deo’s are for sure worth it! They don’t only protect against unwanted smells but it also moisture my armpit! So good job dove! I really love the new formula from the deo’s! Een goed verzorgende deo vind ik wel echt een must. Zeker omdat scheren mijn oksels echt wel beschadigd. Ben erg benieuwd geworden! Ja dat klopt totaal dat is echt wel een must! Dove heeft fijne deo’s, alleen dat merk gebruik ik niet meer. En inderdaad de dove deo’s zijn zeker enorm fijn! Ik heb de deo’s van Dove altijd fijn gevonden, deze zien er ook goed uit! Komkommer en thee, dat is een heel zachte, lekkere geur! Goh, ik heb nog een keer model gestaan in een advertentie campagne voor Dove. Mooi merk! Ja klopt echt een heerlijke geur! Ik ben echt gek op de deo’s van Dove, wissel het ook graag af met Nivea black & white!